First announced over a year ago at the Fort William World Cup alongside the new Saint flat and Saint SPD pedals, the PD-M8040 is the first ever flat pedal from Shimano to wear the Deore XT name. 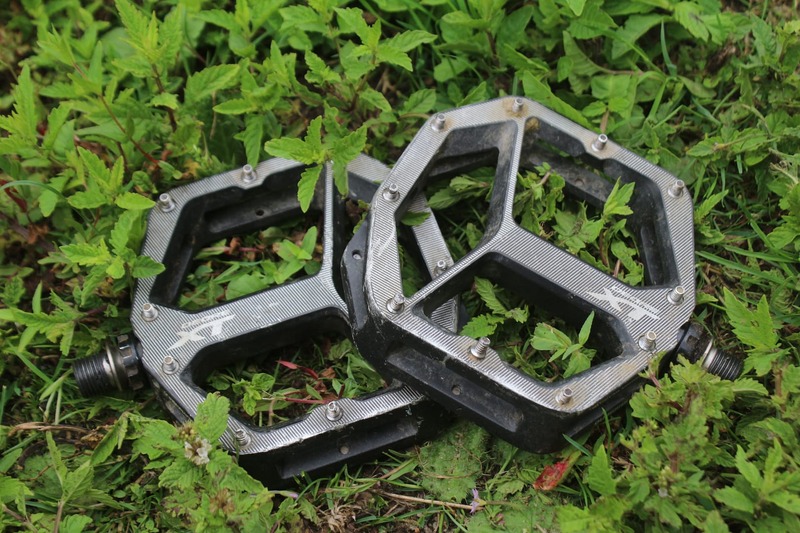 Joining the Deore XT SPD pedals, the XT flat pedals are pitched at the trail, enduro and e-MTB markets. This is a bit of a shift for the Japanese brand, which up until now has only marketed flat pedals for BMX and DH racing. 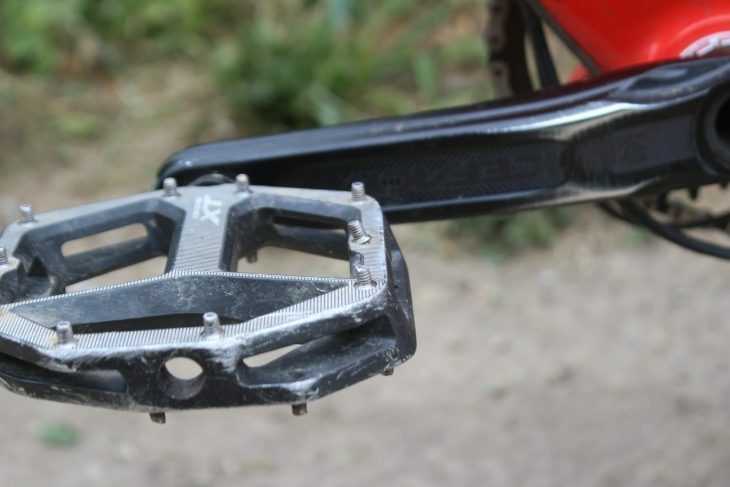 As more everyday trail riders look to pedal with flats rather than clips however, Shimano has sought to expand its range of flat pedals and shoes accordingly. In terms of price and functionality, these pedals sit in between Shimano’s entry-level GR500 flat pedal (£59), and the high-end Saint M828 flat pedal (£129). Selling for £89 for the pair, the XT flat pedals can be had in two platform sizes to suit different shoe sizes. I’ve been testing a set of the Large size for the past three months, which come in at 491g as tested. Shimano’s new Deore XT flat pedal comes in two different sizes. Manufactured from big hunks of forged alloy, the XT flats get a very robust platform for stomping your foot down onto. The body is hollowed out through the middle for mud-shedding, and chiselled around its perimeter to reduce weight. 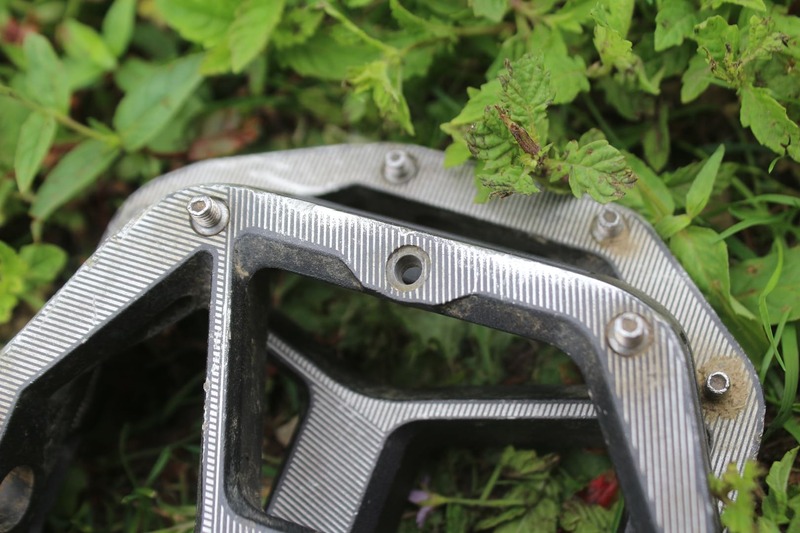 Chamfered edges aim to help the pedal slide off of rocks rather than jam onto them, though the angle of these chamfers isn’t as obvious as what you’d find on say, a DMR Vault. Shimano’s listed dimensions are a little off – I measured the usable platform of these at 108mm long and 110mm wide, and not 110mm x 115mm as claimed. Being the M/L size, these are recommended for shoe sizes from EU 43 and above. If you’ve got smaller shoes than that, the S/M size drops the platform length and width by 10mm each way. They’re not the thinnest of pedals, but they do have an excellent platform with a slightly concave shape. They’re not the thinnest of pedals, measuring 18mm thick at the centre of the body. Compare that to 17mm for the DMR Vaults, 15mm for the Hope F20s, 10mm for the Gamut Podiums, and 8.3mm for the OneUp flat pedals. 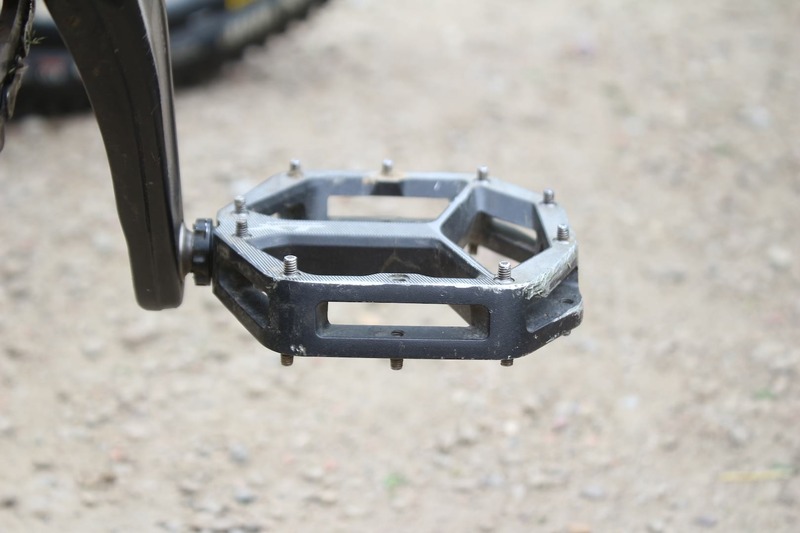 The XT pedals do have a nice concave platform though, with the bodies measuring 20mm at the fore and aft of the platform, providing a slight bowl shape for your feet to sink into. We’ve been testing the Deore XT flat pedals with several different shoe types, including Shimano GR7s, Bontrager Flatlines, and Five Ten Freerider Pros. All shoes have been size EU 43-45. In all trail scenarios, I’ve found the length of the XT pedals to be nice and supportive, with plenty of stability through the arch of the foot. Having gotten used to the enormous platform of the Pedalling Innovations Catalyst pedals (which measure 130mm long! ), I tend to run my feet quite far forward on the pedal surface, positioning the axle almost right in the middle of my shoe. I find this helps with overall stability and power transfer, while reducing strain on my achilles and calf muscles. For this type of riding position, the big platform of the XTs is fantastic. The platform feels fantastically supportive underfoot. They are quite wide though, and that’s particularly noticeable if you have narrower hips and run your feet closer to the crank arms. This leaves an exposed edge on the outside of each foot, which I’ve managed to catch (evident by the gouges in the photos) on the many ruts and rocks that line our rough and natural valley trails in Calderdale. The flipside of this wider Q-factor is that the XT flats do add noticeable stability by placing your feet further apart – kind of like using a wider handlebar. This is ideal for gravity-type riding, and those newer to the sport will also benefit from the improved stability. Riders with bigger and/or wider feet will also appreciate the big platform. If you do ride with a narrower stance though, it may be worth considering the S/M size that shrinks the width down by 10mm. 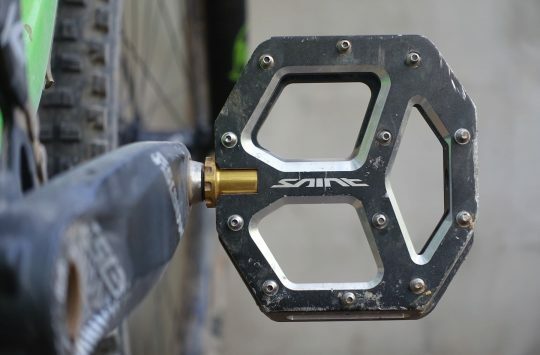 The other option is the new Saint M828 flat pedals, which may be the Goldilocks size with a claimed 110mm length and 105mm width. I’ve just started riding with a set of these, so check in at a later date for my review on those. 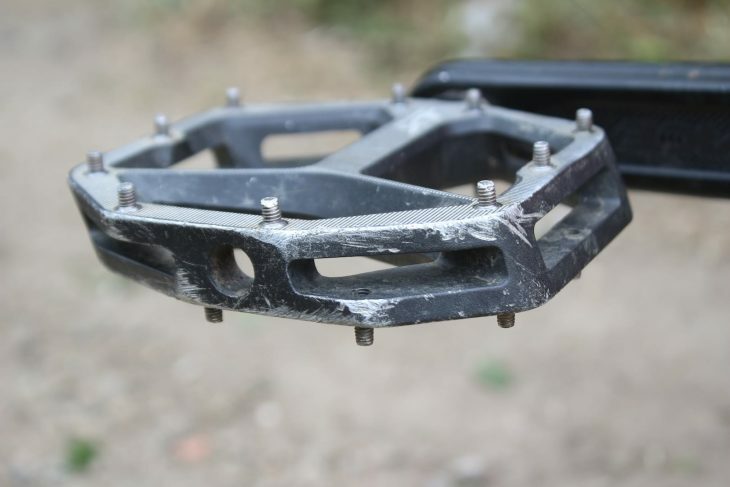 Our test pedals have been absolutely punished, and some of the pins haven’t made it this far. 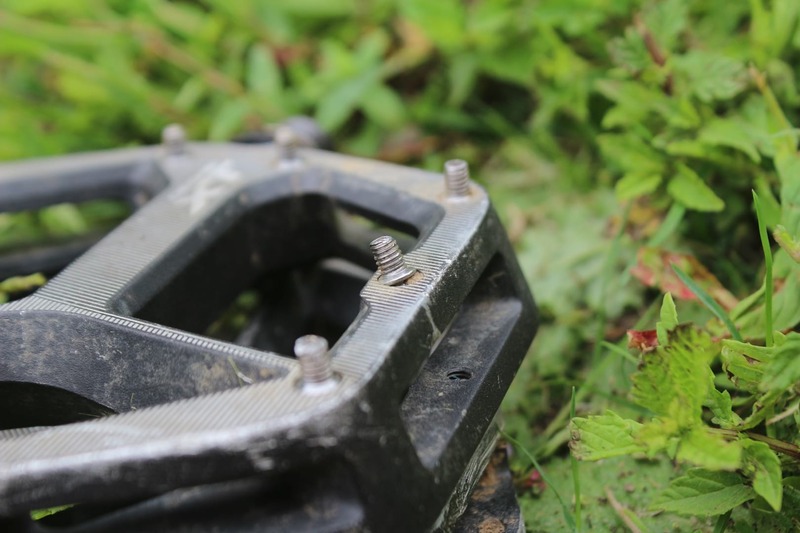 Each side of the XT flat pedal gets 10 screw-in pins. The stock pins are very shallow and not particularly grippy with their smooth rounded heads. I’m guessing these are designed for recreational riders who want a quality flat pedal, but might be scared off by shin-chewing pins. Before hitting the trail for the first time, I removed all of the stock pins and fitted the 5mm pins that come inside the box. The threads already come prepped with blue Loctite, which makes them firm to screw in. Once in place though, they aren’t likely to go anywhere. You can of course adjust the grip levels by mixing and matching the short and long pins, but I just went full-length all round for maximum grip. And boy are these pedals grippy! Combined with the large platform and the concave shape, the steel pins hold onto your shoes with vicious traction, providing plenty of small edges to bite into soft shoe soles. The DMR Vaults are known for being one of the grippiest out there, but I’d say these XT pedals are at least on par with the Vaults. I installed the taller pins right away – these are much grippier than the shallow pins that come installed from the factory. Unlike Shimano’s old Saint and DX flat pedals though, the pins used on the XT body don’t thread in from the back. Instead, Shimano uses steel grub screws that thread directly into the pedal body. This presents an issue if you grind a pin against a rock, as you’re also grinding away the surface that you would insert a 2mm hex key into for installing or removing the pins. Once this happens, it’s a case of getting out the ‘negotiator’ (pliers) to remove those busted pins. That bent pin is hiding an ovalised thread bore. On both pedals however, I’ve also managed to fatally bend the most forward and central pin that hangs underneath the pedal while you’re riding. In each case, I’ve managed to not only bend the pin, but actually ovalise the bore in the pedal body as well, rendering that particular thread useless for fitting a replacement pin. These could potentially be salvaged by using a helicoil kit, but it’s still a bummer given that this is a product that is basically going to spend its life getting intimate with rocks and roots on the trail. With a platform that’s as large and as thick as these, those encounters are going to happen more frequently than they would with thinner-bodied pedals. You can see the bore is ovalised slightly front to back, with a small dimple in front of the bore. I’m certainly no engineer, but from what I can tell the two damaged bores are located in the thinnest part of the whole body, so I’d like to see this area beefed up a touch. The pins could also have a longer insertion depth, since the current ones are quite shallow and don’t actually penetrate the entire thread of the bore. 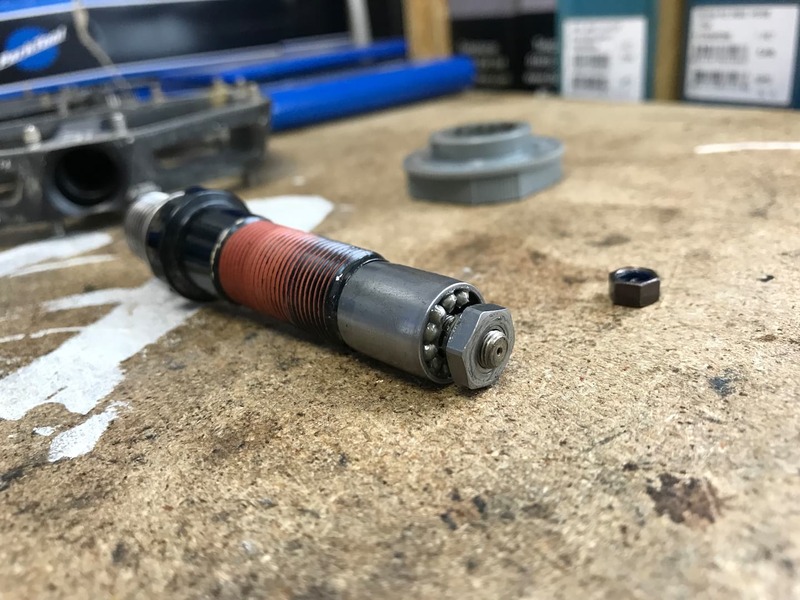 They do use a standard M4 thread pitch, so you could always replace them with longer M4 grub screws to provide more adjustability, and potentially better support for each pin as well. I’m well aware that this is considered as crash damage, so it’s entirely outside of Shimano’s typical warranty policy. 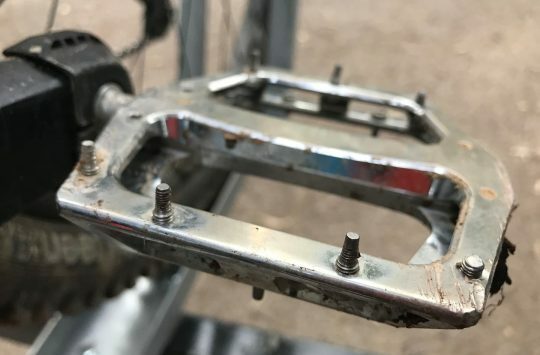 I’m also aware that smacking pedals has a lot to do with technique and the bike you’re riding, and not everyone will put these through the same beating that I subjected them to. You’ll need Shimano’s TL-PD40 tool (the grey plastic ring to the top right) to pull the pedals apart. 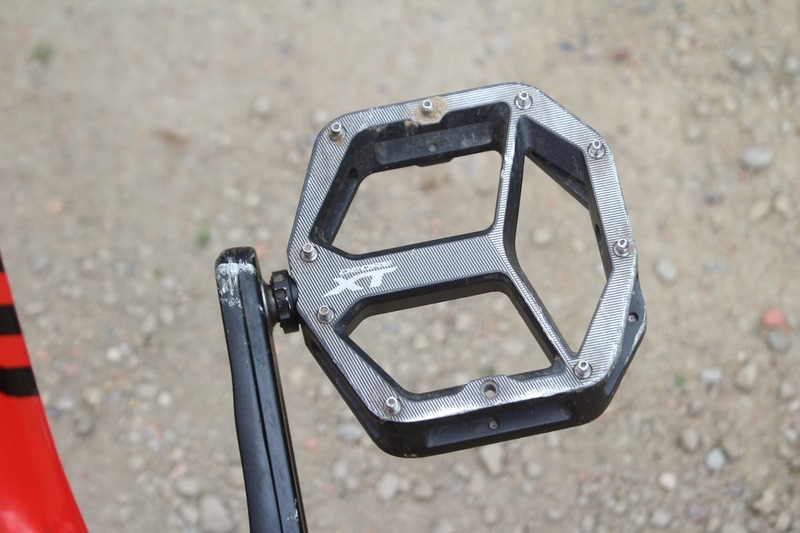 Aside from the bent pins, the XT pedals have largely been trouble-free. 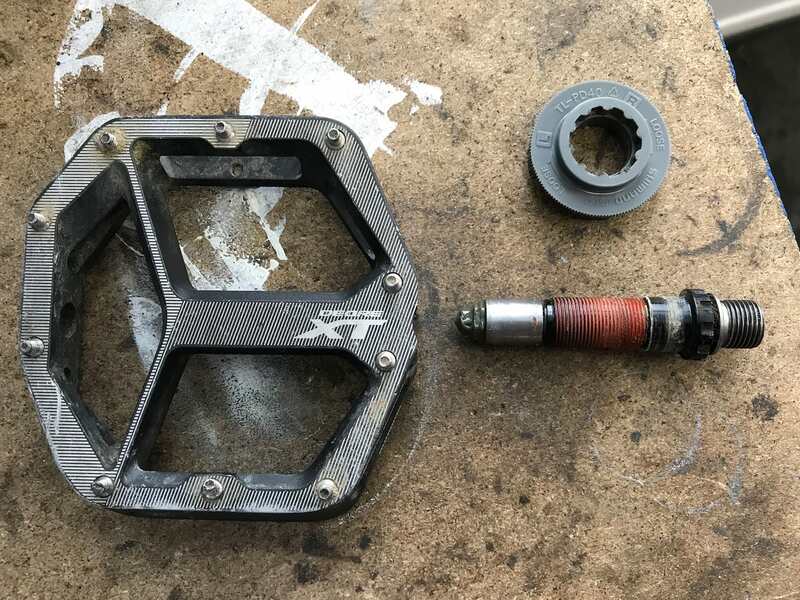 The bearings have spun nice and smooth throughout testing, though more recently I did notice a small amount of play between the body and the axle, so I got my hands on Shimano’s plastic TL40 tool to pull the pedals apart and take a gander at the insides. Here you can see one row of ball bearings on the outer end of the axle. It all comes apart for cleaning and re-greasing the ball bearings. Once you undo the black lock bush, the chromoly axle and all of the spinny bits come out of the pedal body with it. On the end of the axle is a lock nut, and then the primary cone that you use to adjust the preload on the bearings. Just like a Shimano hub, there are two rows of cup ‘n’ cone bearings, and each one contains 12 large diameter ball bearings, which are quite a bit bigger than what you’ll find in the average cartridge bearing used in many other pedals. Things can get a bit fiddly with pulling the bearings out to clean them, but it’s really not that difficult to do. And technically you do require a very small 10mm cone spanner to retighten the bearings, though I ended up improvising with some needle-nose pliers to get the job done. Once tightened up and reinstalled into the pedal body, the play had disappeared, and the bearings were back to spinning smoothly again. These are terrific flat pedals, though they’re not quite perfect. With its large platform and slightly concave shape, the XT flat pedals provide excellent support and traction thanks to a ‘just right’ pin arrangement. They aren’t the most low-profile pedal, and that does mean they will come in the firing line more often – particularly if your bike has a low bottom bracket. 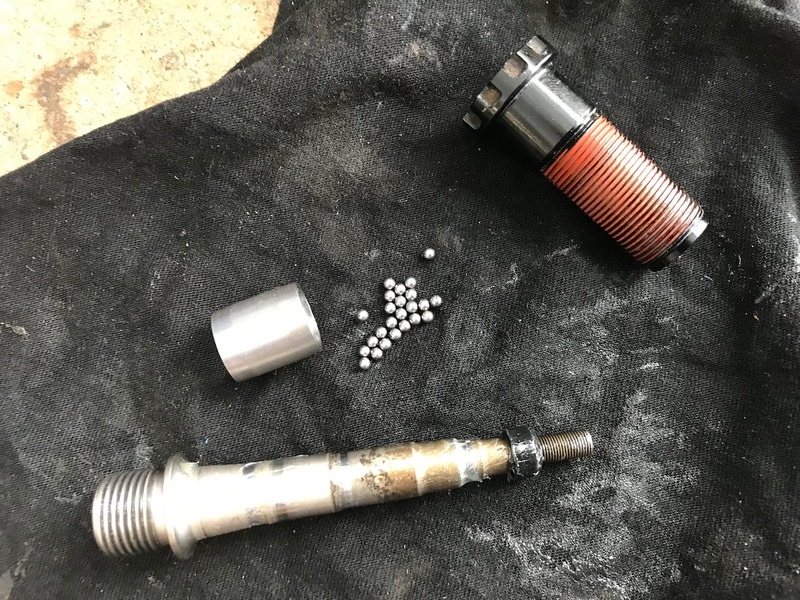 I was bummed to have busted two pins and ovalised the thread bores, but this is mountain biking, and stuff breaks – especially when you whack it really hard into unyielding objects like rocks. That said, we’ve tested plenty of flat pedals over the years, and very rarely have we actually busted a pedal in such a way. For that reason, I’d find it hard to recommend these over a pair of DMR Vaults, which retail for 10 quid more, but have a much more proven track record when it comes to reliability. If Shimano could beef up the pins and the bodies in the respective areas though, they would surely have a near-perfect option with the XT flats. 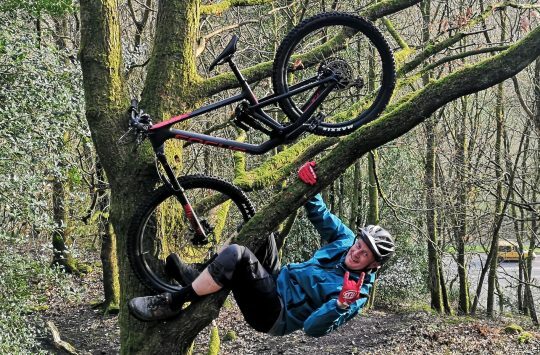 Aston Hill Mountain Bike Park Needs Your Help! 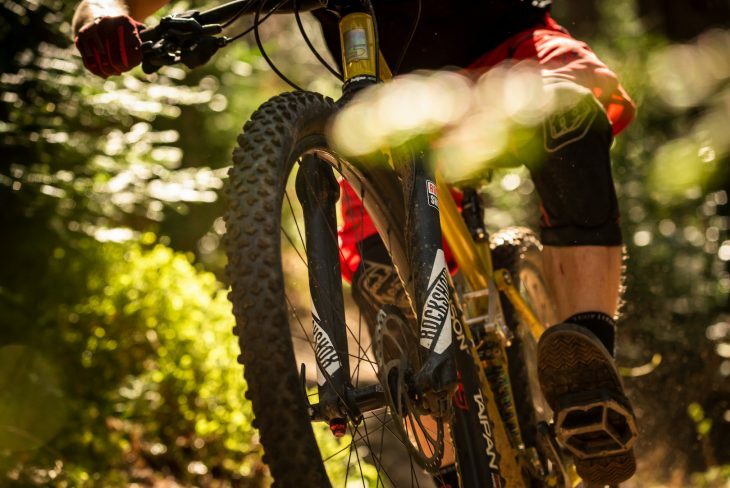 Video: See the Cotic SolarisMAX in action!